DHL & C4C: Three anniversaries in one year! 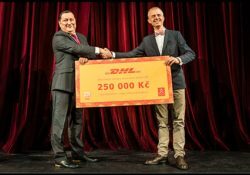 Program Robin Hood – 23 orphanages in Ostrava and surrounding area receive much needed brand name clothing, shoes & LEGO toys from Robin Hood team in cooperation with DHL in Ostrava. Dr. Clown Program – Kladno Knights team join Dr. Clown for a surprised visit at Kladno hospital. 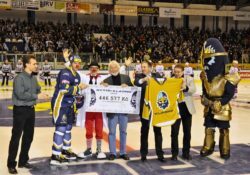 Dr. Clown Program – Ice Hockey legend Jaromir Jagr and his Kladno Knights team battle the Liberec White Tigers in Golden Jerseys for the benefit of C4C’s Dr. Clown program. All together nearly half a million CZK were raised to bring happiness & joy to hospitalized children. Dr. Clown Program – C4C’s Dr. Clown team picking up a van load of LEGO sets for hospitalized children all over the Czech Republic at the LEGO plant in Kladno. 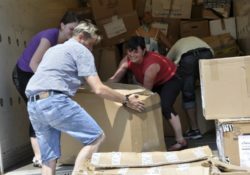 Robin Hood Program – 14 orphanages in Brno and surrounding area receive much needed brand name clothing, shoes & LEGO toys from Robin Hood team in cooperation with IVECO-STROJSERVIS in Horni Pocernice. 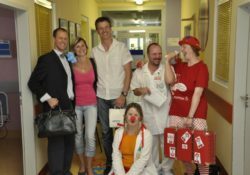 Dr. Clown Program – Damian the Magician & Dr. Clown team cheering hospitalized children in Prague’s Vinohrady hospital accompanied by special guest – PR Manager of PPL.